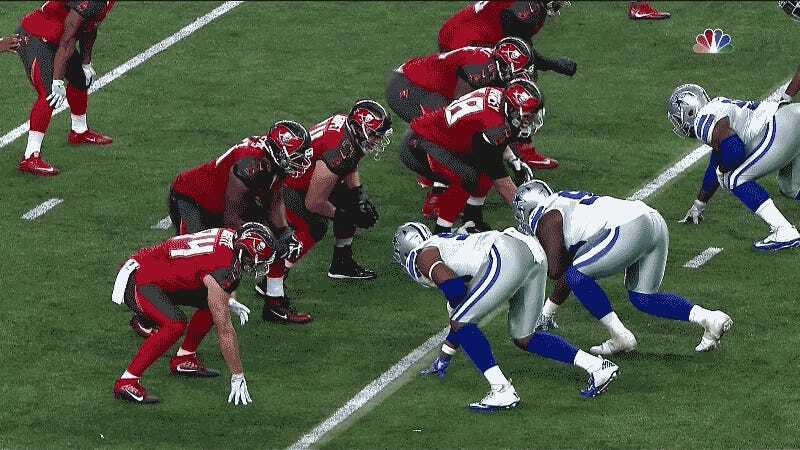 We’ll talk about how Cowboys defensive tackle David Irving took over last night’s game and ate the Buccaneers’ offense whole, but first I just want you to spend some time admiring his work in the GIF above. Irving, No. 95, is the guy sticking right tackle Gosder Cherilus into the ground with one flick of his shoulder before changing direction and flattening Jameis Winston. You sometimes hear people talk about the allure of the NFL’s brand of brutality, and such a thing can be hard to spot when each week brings us hysteria-inducing brain injuries and limbs bending in ways that force you to look away. But then there are plays like the one above, a few brief seconds in which football truly does achieve its aspirations toward beauty and violence. It takes a lot to go 12-2 in the NFL. It takes a rookie running back and quarterback both playing like seasoned all-pros; it takes the best offensive line in the league; and sometimes it takes a backup defensive tackle stepping into a starring role in the fourth quarter of a tie game and deciding that the opposing quarterback is simply done completing passes for the night.